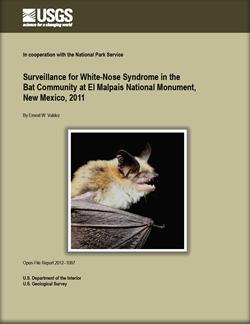 In 1999 and 2000, FORT conducted a survey of bats at El Malpais National Monument and adjacent lands. During this study, several species of bats were documented, including some that are known to use caves or lava-tube formations as roosts. In the winter of 2006–2007, the fungus-caused disease known as “white-nose syndrome” (WNS) began devastating populations of hibernating bat species that use caves and mines in the eastern United States. Since then, this disease has been spreading westward and has the potential to affect a greater diversity of bat species in the Southwest, as well as affect local populations of bats at El Malpais National Monument. Because El Malpais National Monument is comprised mostly of several extinct lava flows filled with many crevices and lava tubes, there is a great potential for many of the existing bat species to use these locations as hibernacula. Given the complexity of this habitat, locating unknown hibernacula has proven to be difficult, particularly in the context of managing for the occurrence of white-nose syndrome. Therefore, scientists from FORT conducted field studies to locate unknown hibernacula and document the use by bats at known cave systems at ELMA using acoustic monitoring. In addition, FORT scientists collaborated with the University of New Mexico to search for the presence of WNS on bats at the monument through mist-netting and micro-biota swabbing. Opening of a small lava tube at El Malpais National Monument, New Mexico, with Tom O'Shea and Cody Valdez looking in. Public domain. Biologist Ernie Valdez examines a bat. USGS photo. Acoustic detector mounted on a mast near the entrance of a lava tube opening at El Malpais National Monument, New Mexico. Photo by Ernest Valdez, USGS, public domain. The purpose of this study was to locate new hibernacula, as well as provide an up-to-date assessment of bats and their micro-biota that occur on El Malpais National Monument. This study provides new insight to what species may be affected by the potential occurrence of white-nose syndrome. Moreover, information from this study will provide information that is critical for managing habitat of the park as well as insight to what species may be using the lava tube systems. This study was be initiated with a review of the literature, as well as the database of species encountered during the 1999-2000 bat assessment conducted US Geological Survey. Field studies that include acoustic monitoring and mist-netting bats over open water sources targeted early emergence of bats during late winter and early spring that allowed for detection of hibernacula across the landscape and fungal hyphae, respectively. Spectrograph of an acoustic recording from the western small-footed myotis (Myotis ciliolabrum) noting shape and frequency of call with photo of the western small-footed myotis and cartoon representation of this bat echolocating below. Photo by: Ernest Valdez, USGS. Public domain.